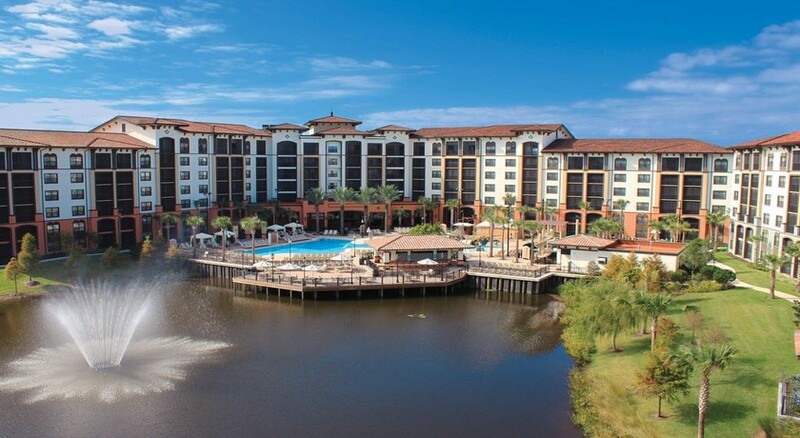 Sheraton Vistana Villages Resort Villas I-Drive is a luxurious family-friendly resort in the buzzing resort of International Drive in Orlando. Offering top-notch facilities and warm hospitality, the hotel is a top favourite among couples and families. 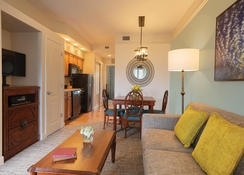 Plush, furnished one and two bedroom villas with fully stocked kitchens and all modern amenities greet guests here. Expansive lush grounds, tropical pools, tennis courts, excellent restaurants and bars, fitness centre and children's activities ensure you’ve ample leisure and entertainment activities for enjoying a fun-filled holiday to Orlando. 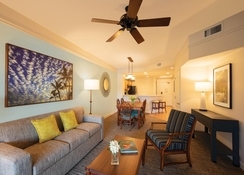 Its proximity to cafes, restaurants and tourist attractions, free shuttle services and an array of recreational and entertainment facilities make Sheraton Vistana Villages an ideal accommodation option to enjoy the Floridian sunshine and adventure. Sheraton Vistana Villages Resort Villas I-Drive is centrally located in the International Drive area with proximity to all tourist attractions. It is located a short drive away from Walt Disney World (6.4 km), Universal Studios (16 km) and SeaWorld Orlando (3.2 km). Other leisure and entertainment options near the hotel are Grande Pines Golf Club (1.6 km), Florida Mall (9.7 km) and Prime Outlet Factory Mall (16 km). The nearest airport is Orlando International Airport, around 22 km away. Sheraton Vistana Villages Resort Villas I-Drive features more than 1,150 opulent one and two bedroom villas with modern furnishings and homey ambience. The one bedroom villas can accommodate four adults and the two bedroom villas up to eight people. The villas have a garden or water views, fully equipped kitchen, dining room, living area and are furnished with two televisions, DVD player, cable channels, balcony or patio, sleeper bed, breakfast bar, Wi-Fi and en-suite bathroom with walk-in showers. The kitchen features cooktop, microwave, refrigerator and dishwasher. Flagler Station Bar & Grill, the all-day dining venue, serves a variety of American classics, such as onion rings, nachos, chicken wings, slow-roasted prime rib, plus salads, burgers and sandwiches. Guests can enjoy non-alcoholic beverages and tropical cocktails, including margaritas and pina coladas. The restaurant features a poolside outdoor patio as well as indoor seating. 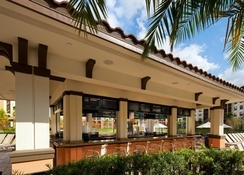 The alfresco Pirate's Cove Pool Bar offers alcoholic and non-alcoholic drinks, complemented with light snacks. 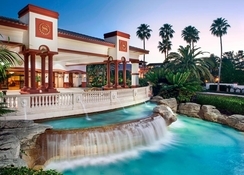 The Sheraton Vistana Villages Resort Villas I-Drive has a number of outdoor pools, including a quarter-acre pool with a dramatic waterfall and a zero-entry pool. All the pools come with a poolside shop and complimentary towels. Guests can relax on the sun terrace and have a drink at the poolside bar. 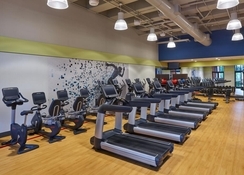 There’s an on-site fitness centre and 2 games rooms. 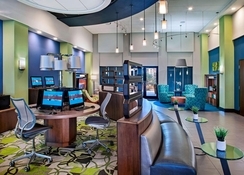 The resort offers a number of activities for the entire family that include sand art, tie-dye, cookie decorating, water sports, volleyball, tennis, shuffleboard, fitness classes, yoga, aqua Zumba, water aerobics, kids’ night out, parties, live music, wine tastings, movies and karaoke nights. It also arranges theme park tickets and shuttles to most tourist attractions. Hotel Interior and Exterior painting renovation and The St. Augustine Pool renovation, Starts from AUGUST 11, 2018 to AUGUST 25 AND SOME OCTOBER 19, 2018. There will be some machine noise and dust as the pool will be resurfaced and the deck area cleaned. During this time there are two other large pools and water play areas that will be open for guest use; the award-winning Resort Pool area and more quiet Key West Pool area will be available. One of the buildings (#25) in the St. Augustine area of the resort will undergo some interior renovations; and in the same area, building #26 will be out of order for exterior painting which is scheduled August 11 - August 25,2018 .